In a case of first impression, the Board ruled that a color mark consisting of multiple colors applied to product packaging cannot be inherently distinctive. 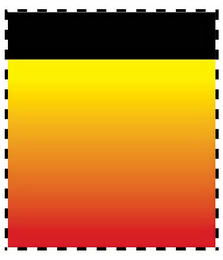 Consequently, since Applicant Forney Industries did not seek registration under Section 2(f) in the alternative, the Board affirmed a refusal to register the mark shown below, comprising the colors "red into yellow with a black banner located near the top as applied to packaging" for applicant's metal hardware, welding equipment, safety goods and marking products. In re Forney Industries, Inc., 127 USPQ2d 1787 (TTAB 2018) [precedential] (Opinion by Judge Linda A. Kuczma). We agree with the Tenth Circuit’s analysis of the relevant case law, and hold that a color mark consisting of colors applied to product packaging cannot be inherently distinctive, and may be registered on the Principal Register only upon adequate proof of acquired distinctiveness. Under that legal standard, we find that Applicant’s color mark which is not combined with a distinctive well-defined shape, pattern or other distinctive design is not inherently distinctive. Conclusion: Colors alone cannot be inherently distinctive. Even if they could be, nothing in the record presented in this case indicates that Applicant Forney’s multiple color mark would be perceived as inherently distinctive. Because applicant did not request registration under § 2(f) in the alternative, acquired distinctiveness is not at issue. TTABlog comment: So multiple colors on a product can be inherently distinctive? "We also see no legal distinction between a mark consisting of a single color and one, such as Applicant’s, consisting of multiple colors without additional elements, e.g., shapes or designs." I'm pretty sure I know how the TTAB would feel about multiple colors on a product. You better go into that situation with the expectation of appealing the TTAB decision in federal court. Apparently the TTAB cannot recognize a pattern or design if it has color. They apparently think that a pattern or design has to have a distinctive peripheral shape. Sounds and smells do not have peripheral shapes!